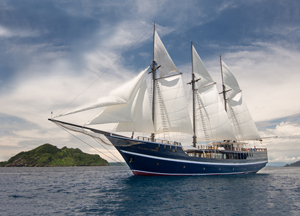 Join one half of the Digital Duo, Sue Drafahl, on an 11-night diving adventure as they cruise the waters of Indonesia aboard the Dewi Nusentara. This group of majestic islands located in the northwestern tip of Indonesia’s Papuan “Bird’s Head Seascape” lies in the heart of the coral triangle, the most bio-diverse marine region on earth. We have been aboard this boat before and it is beautiful. In addition to some fabulous diving, Sue will be available if needed to help you trouble-shoot your digital camera problems and provide pointers as you work with your images in Lightroom and Photoshop. 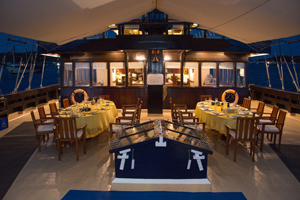 You will find this boat luxurious and spacious, with a crew that caters to your every need. With a guide ratio of 1:3, this is the perfect vacation for the diving photographer. The crew is attentive, well trained, and at your disposal at all times. 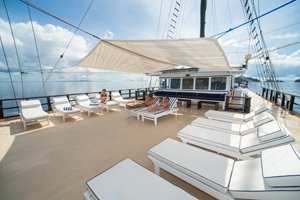 This majestic three masted schooner features 8 staterooms and a master suite. 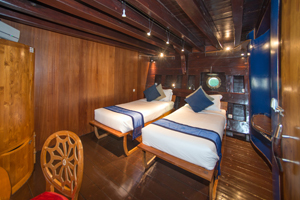 All Deluxe Staterooms are extremely spacious, air conditioned, and are adaptable for either twin or double use. 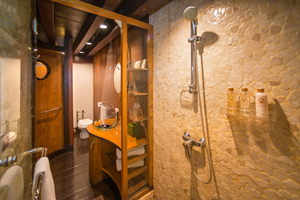 Each has its own en-suite bathroom. 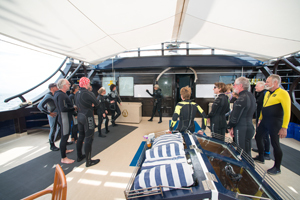 There are only 4 to 5 divers per dive guide to provide attentive guide assistance. They even provide a short neck and shoulder massage after each dive. 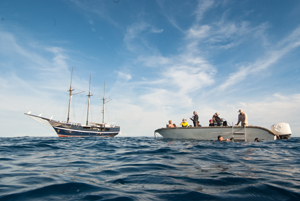 They have great on-board facilities for the underwater photographer and videographer. There is a very spacious dedicated camera and equipment room with multiple charging stations, and camera benches. The electricity supply on the Dewi Nusantara is 220 volts, but transformers are available for 110-volt specific equipment. 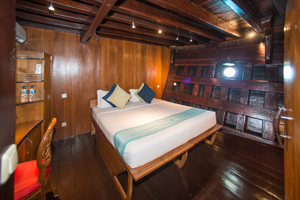 The Dive Package includes : all meals, snacks and beverages (not included wine and spirits), transfer from the airport to the vessel, up to 4 dives per day, all air fills, weights and weight belts, Nitrox can be added for the trip for $200 . They also offer rental gear for hire if needed. Nitrox, park and harbor fee, gratuities, International airfare, wine or spirits on board, Domestic airfare and hotel charges while in Indonesia, not included. DAN insurance and trip insurance are required. 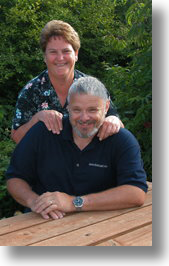 To join us, contact digitalduo@jackandsuedrafahl.com (503) 842-9979 or (503) 812-1212 cell.